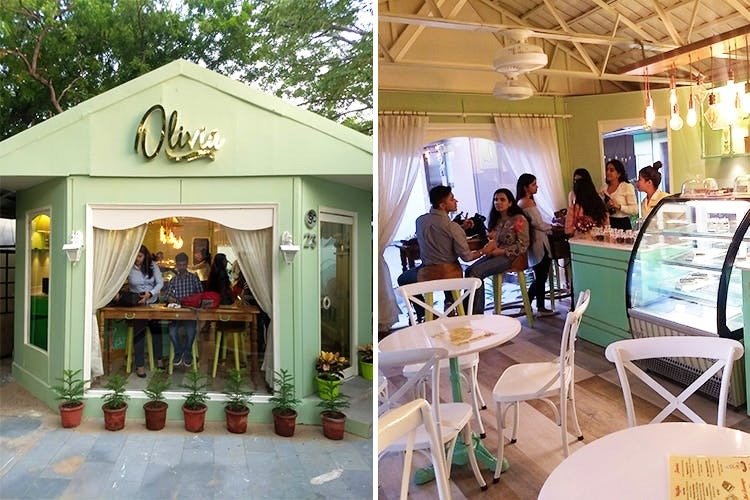 Olivia Cafe & Patisserie just opened two outlets in the city: One at Santushti Complex and another at Ambience Mall, Vasant Kunj. This dessert parlour and ice cream nook makes its own ice creams and does waffles, shakes, brownies, froyo and chai/coffee. Homemade ice creams—try Coffee Oreo and Toffee Caramel. Their Caramel Sponge cake and Seductress (a rich combination of dark rum and dark chocolate) are also worth a try. The Santushti outlet resembles a quaint tea room in the middle of a garden. The shades of teal and white and a cosy, cottage-like feel can fool you into believing that you’re not in a manic part of the city. This makes their Oreo Cheesecake even nicer. Add to this their creamy ice creams, waffles and green tea (to cut down on the sugar rush), and we got a winner. Our heart melted at the sight of their fruity and chocolate-y ice creams that are made with the best chocolates and other ingredients they can source. While our evening here was sweet as hell, an acquaintance went as far as to say that Olivia’s desserts are ending her love affair with The Big Chill. Now go, test out this claim on your own. A couple of more savoury options to wash down all the sweetness, perhaps? Also, it isn’t the most spacious cake heaven in the city (it’s a little bigger than Big Chill cakery at Khan Market). Carry a government-approved ID proof for entry into Santushti Complex.Also, a Thai restaurant opened this weekend right next to Olivia. Try them out and hop over to the parlour for dessert later.